Our Little Miracles: Merry Christmas! We hope everyone had a good Christmas. We took TONS of pictures. 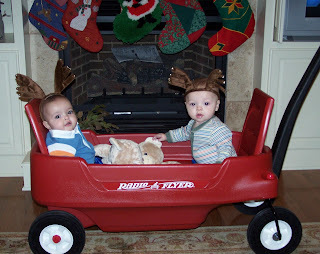 Here is one of the boys in their new wagon they got from Grandma and Grandpa Jones. I love the wagon, the girls got one for their first Christmas and it was so helpful wheeling them around the house rather than having to carry both everywhere. We just strapped in and they loved it! How was your week at home with them? It looks like you had a wonderful Christmas!